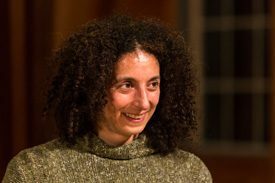 Tzveta Kassabova is a Bulgarian-born choreographer, costume designer, and installation artist named one of the “25 to watch” in 2012 by Dance Magazine. At different times she has been a gymnast, physicist, and meteorologist. As a dancer, Kassabova has been part of the dance companies of Ed Tyler, Sara Pearson/Patrik Widrig, and David Dorfman, and has performed in works of Mark Haim, Nancy Bannon, Maurice Fraga, Zoltan Nagy, Joshua Bisset, Netta Yerushalmy, Bill Young, and Colleen Thomas, among others. Her work as a choreographer has been presented at St. Mark’s Church (NYC), CSPAC (MD), Dance Place (DC), Kennedy Center (DC), Ririe-Woodbury Dance Company (UT), Test!0 (Croatia), NBU (Bulgaria), Judson Church (NYC), Mahaney Center for the Arts (VT), Reston Art Center (VA), Bennington College (VT), Dixon Place (NYC), Mulberry Street Theater (NYC), and Artomatic (DC), among others. Kassabova received a Metro DC Dance Award (2008), the Prince George’s Arts Council grant (2009 and 2012), and Maryland State Arts Council Award (2010 and 2011). She holds three Masters degrees. She has been on the faculty at Middlebury College, University of Florida, George Washington University, and the University of Maryland – Baltimore County. Kassabova believes that dance is a visual art form. She has always been fascinated by the concept of space and is constantly trying to address it in both her choreography and her design.